Pioneers in the industry, we offer embossing sticker from India. These colourful stickers does the work of glossifying the embossed content. 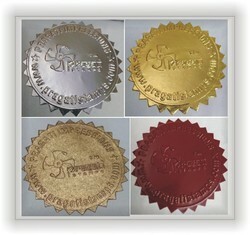 It is widely used on certificates and also for sealing purposes. You can choose colour of your of choice. And can make the emboss more purposeful and elegant by look.